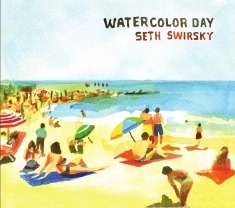 Now, just two years later, comes Swirsky’s highly ambitious (18 songs in just 43 minutes) Watercolor Day. To borrow a phrase coined by the great Nick Lowe, this is truly an album of pure pop for now people. But to Paul Ellis, music-historian and member of the highly acclaimed rock group, Pop Archaeology Transmission, the songs on Watercolor Day can be compared with the best in the pop genre: “I was going to say that Seth has created one of the best current retro ‘60s Sunshine Pop albums out there, but that’s not the whole story. What he’s actually created is one of THE best albums in that style, ever. Period. Regardless of the “when” aspect, this is 21st century Wrecking Crew stuff. If you heard his Red Button album — She’s About to Cross My Mind — and now with Watercolor Day (and his first album, Instant Pleasure), you’ll know what I mean when I say he’s a stunningly great pop songwriter, in the same company as some of the greats of the 1964-1974, golden era of pop music. The welcoming Title song builds from a tuneful folkish strum until it is visited by pedal steel droplets, a crunchy, full-blown horn section and twisting guitar candy, balanced over a gallop-and-trot rhythm. There is even a coda at the end of the album (who does codas these days?) in the form of the song “I’m Just Sayin’” – which beautifully interweaves four melodies from earlier songs, in effect, “tying up” the album in a nice, neat bow. Swirsky spent years as a staff songwriter for Warner-Chappell and EMI, writing a number of worldwide hits for a startling variety of artists, including Taylor Dayne (“Tell it to My Heart”), Al Green (“Love is a Beautiful Thing”), Rufus Wainwright (“Instant Pleasure”), Jane Weidlin of the Go-Gos, Tina Turner, Celine Dion and Smokey Robinson, among many others. He has garnered 32 gold and platinum records and numerous ASCAP songwriting awards.